It's no secret that I have struggled with acne. Most of you have probably noticed acne scars in my photos. It has been five years since my horrific breakout and in those five years I have tried so many products to make sure I don't go through that again. I understand that we all have different skin and our skin reacts differently than the next person's might. However, these are a variety of products across the board and when your face is going through a break out, most people will try just about anything. (make sure if you are trying a new product to test it on a small area or consult your doctor/dermatologist). Bioelements Breakout Control // This is my go-to acne spot treatment. Use this at night or layered under your makeup and you will see results right away. Any pimple I have is generally gone within a couple days after using this. Renee Rouleau Anti-Cyst Treatment // This spot treatment works if you have cystic acne or really painful acne. I was overwhelmingly surprised how well this worked. I had cystic acne five years ago and this helped clear it up within weeks. Orgins Super Spot Remover // This is a great salicylic acid spot treatment. This helps dry out your pimples, reduce redness, and reduce the size. It may sting when applied to a pimple but that's because the salicylic is working! Clean & Clear Spot Treatment // If you are not wanting to break the bank I recommend this drugstore acne treatment. Although this treatment did not work as well as the other treatments above, it did help minimize the appearance and reduce redness. Lemon // This is a great natural way to help rid of your acne. Cut a lemon in half and rub it all over your face (I don't recommend doing so if you have open sores). 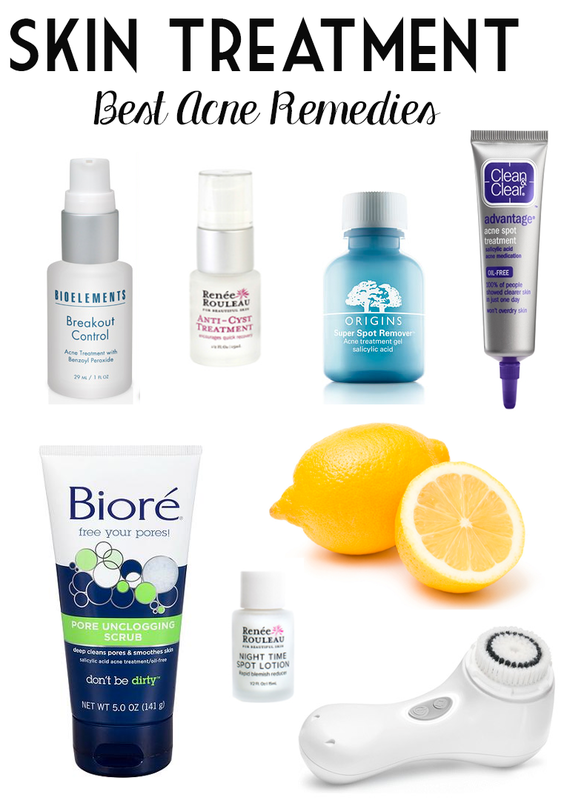 The lemon helps to dry out pimples and reduce redness. Biore Pore Unclogging Scrub // I love this scrub, my face feels very refreshed and bright after I use it. It's almost similar to using mouthwash in your mouth…that's how your face feels! It's a great pick me up and I notice that it helps significantly reduce any acne I have and helps prevent new breakouts. Renee Rouleau Night Time Spot Treatment // This treatment is great for the end of the day when you notice pimples. It works overnight to dry out and treat your acne and you will be very surprised to see a noticeable difference the next morning. Clarisonic Mia 2 // I can not live without my Clarisonic anymore. I accidentally left the charger at home when I went on vacation and my face started to break out and became very dull. I use the acne head brush in the mornings and the deep-pore cleansing head at night. Both of these brush heads work great to prevent breakouts and clear breakouts up. You will notice more breakouts when you first start using this but that's because the Clarisonic is pulling up all of dirt and bacteria below the surface. Gross! Another recommendation I will make is to seek your family doctor or dermatologist for treatment. My doctor has prescribed oral medications as well as spot treatments and these help tremendously! Do you have any acne advice? We all have struggles so we might as well share our secrets and knowledge to help one another.